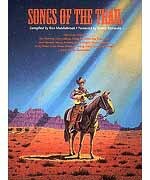 53 songs celebrate the life and times on the range by such noted writers as Doc Denning, Chris LeDoux, Rusty Richards, Roy Rogers Jr., and others. Their music is an actual view into their daily adventures, tribulations and entertainment. This unique publication also features articles on black cowboys, cowgirls, cowboys' Spanish ancestry, and more.